It is not the easiest thing to cook for a household with multiple different dietary modes, especially when some are voluntary and some aren’t. At the moment, I think every single one of us needs a slightly personalized meal plan: Theo is eating some solids but we haven’t introduced everything yet, Nolan is incredibly picky and self-limiting right now, I am gluten-free and trying to limit grain-based starches, and Jeremy likes good old-fashioned food, like chicken and dumplings. 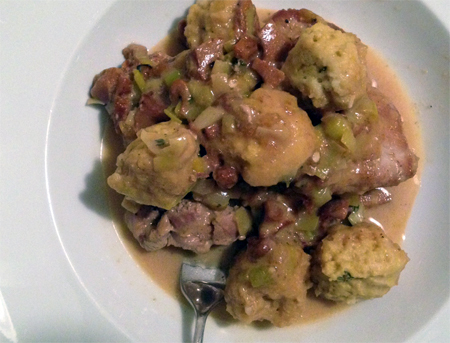 He had been requesting chicken and dumplings for a while, and my first shot at removing the gluten was a grain-free version from the Wheat Belly website using almond flour and flaxmeal. They half-disintegrated in the gravy and had an unpleasant flavor, very disappointing. Fortunately, the second attempt was a winner. I didn’t have any leftover roasted chicken to make this dish as I usually would, so I ended up going with whole boneless skinless thighs instead, seared and then braised with white wine, chicken stock, leeks, garlic, and thyme. The dumpling dough was based on one intended for cauliflower soup, but it suited my purposes perfectly: just chickpea flour, water, olive oil, baking soda and a few seasonings. The dumplings steamed up nicely and held together, and although their flavor was a little stronger than the mild wheat-based dumplings of our past, the texture was comparable if slightly denser. I was very pleased to call this grain-free adaptation a success that we can use in the future. Best of all, this one recipe worked for every one of our unique diets. I pureed some of the chicken thigh with a little extra bone broth for Theo, I gave Nolan some of the gravy and shredded chicken over noodles, and Jeremy and I both enjoyed the whole dish even though it was grain-free and not his first choice. This could easily be made dairy-free by omitting the cream or subbing coconut or almond milk. Heat the olive oil in a wide saute pan or skillet over medium high heat; add chicken thighs and sear until browned on both sides. Remove temporarily to a plate and add the leeks to the same pan, with a little extra olive oil if necessary. Cook until softened, then add garlic and mushrooms; cook until the mushrooms have given up their liquid and begun to brown. Deglaze the pan with the wine, scraping the bottom of the skillet, until almost completely reduced; then add chicken stock and thyme sprigs, and return thighs to the skillet. Cover and simmer over low heat until thighs are very tender, about 30 minutes. Meanwhile, mix together the dumpling ingredients. When the chicken mixture is cooked, stir in the heavy cream. Scoop dumpling batter about a tablespoon at a time (I used a heaping 2tsp disher) into the braising liquid. Cover, and allow to simmer gently for 10-15 minutes, until dumplings are fluffy and cooked through (use a toothpick to check). Source: Adapted in part from An Edible Mosaic.